What could be more threatening for an artist than to be in the midst of another artist with more talent? It’s a fear that plagues amateur and accomplished artists alike. 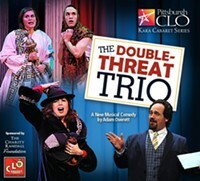 The characters in The Double-Threat Trio grapple with this envy as performers coming to terms with their shortcomings. 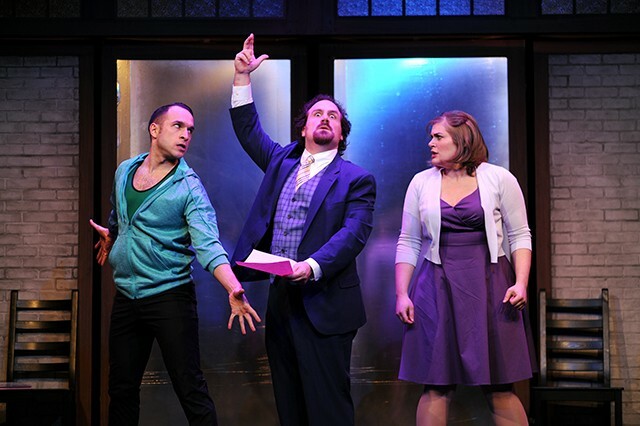 The musical, which had its world premiere with the CLO Cabaret at the Greer Cabaret Theater, is written by New York composer and lyricist Adam Overett. Nina (Drew Leigh Williams) sings but can’t act, Jamison (J. Alex Noble) can act but can’t dance, and Kenny (Jerreme Rodriguez) can dance but, you guessed it, can’t sing. 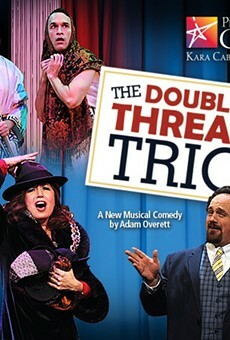 When the three meet at a failed audition (with a sign reading “Seeking TRIPLE-THREATS! !”), they realize there’s potential for success if the three of them join forces. They seek guidance from flamboyant playwright/director/producer/choreographer Millicent (Audra Qualley, understudy for Michelle Duffy). 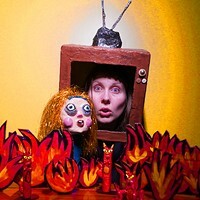 After years of self-exile from theater, Millicent is ready to put on her masterpiece, Oed!, a musical comedy adaptation of the story of Oedipus. Her play is terrible (obviously), but the actors don’t realize it until showtime because they’re too caught up trying to conquer their weaknesses. As the crew moves through play rehearsals, each performer has a moment of clarity on how to improve the skill they’re missing. But when the premiere date gets moved up, they have to scramble. The end result is a true comedy of errors, making the already absurd premise of Oed! even more over-the-top. Props include a gold-painted plunger, a teddy bear with its eyes gouged out, and Crocs. As a premise, the concept of three performers who are good at one skill and bad at another is pretty flimsy. There are plenty of successful actors who can act but not sing, but also, most people who are great in one area of performing can be taught an acceptable level of skill in another. It’s a bit hard to believe Nina, Jamison, and Kenny as performers who can’t act, dance, or sing, respectively, considering the actors themselves are so clearly adept at all three. For their part, all the actors commit to their roles and give it their all, belting songs and feigning terrible line delivery when needed. Qualley has the work of juggling several accents and characters, as Millicent literally wears many hats, changing personas for each of her many jobs: the choreographer is loud and sassy, the writer shy and self-conscious, the director British. It makes for several two-dimensional, stereotypical characters instead of one complete one, but Qualley was still entertaining, shifting roles with impressive agility. Williams was another standout, with a strong voice and solid comedic timing. 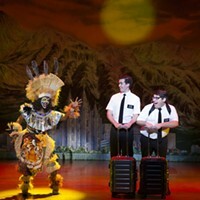 The show’s story starts off a little plain, but as it goes on, the chaos builds into a whirlwind of nonsensical costumes, props, and mishaps. But as a whole, the script lacks enough punch to make it a triple-threat.